Another new setter this week you might think, but this is in fact Zag’s fifth Listener. However, the last was way back in 2002 … and was a numerical. Luckily that’s not the case here as the next isn’t due until 18th February. 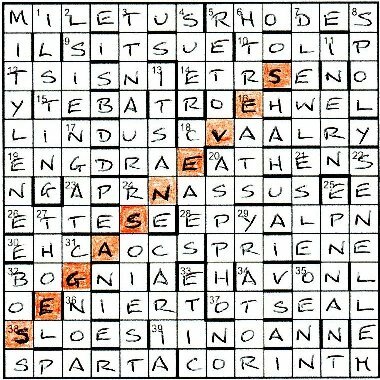 Bias provides us with an entry method that I hadn’t come across before, namely a sequence of letters in each clue’s answer being reversed before entry. Some help was given, with the wordplay referring to the entered form, although in a lot of cases (primarily anagrammy type clues) this didn’t help. There were also nine unclued entries, but they would hopefully become clear when the rest of the grid was completed and a ten-letter phrase revealed. I was encouraged when the first clued entry, 9ac TISSUE had wordplay of SITS + U + E and could be entered straghtaway. No such luck with 12ac INSIST and 14ac TERSE, but 15ac BETA could be entered as TEBA. I solved another six across clues in this first quick pass, but none of them could be fully entered in other than light pencil. 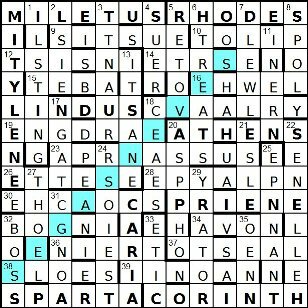 It was the same for most of the few down clues that I solved, although 22dn HELLENES could go in totally reversed since the last letter of 37ac OSTEAL was fixed. I think I was expecting progress to be quicker than it actually was. I suppose that must always be the case when you can’t guarantee that a letter that’s staring you in the face might not go at that position in the answer. You’d think I’d be used to all this by now, but, hey, my mind is slowing down! Not that I am tempted to switch my allegiance to the standard 15×15 blocked puzzles. How lucky those solvers have it, although I suppose they have their own hurdles to jump. I was surprised that the tyrannical nature of Cleobulus and Periander was mentioned, and not, for example, Solon mild-mannered of Athens, or Chilon elephant tamer of Sparta! A final check though the grid, and all was well, except for the realisation that 32ac BOGNI (John returning home: this communicates success) wasn’t the corrupted form of BOING, but of BINGO! A good, entertaining Listener, and hopefully we won’t have to wait another ten years for Zag’s next. This entry was posted on 10 February 2012 at 5:00 pm	and is filed under Solving Blogs. You can follow any responses to this entry through the RSS 2.0 feed. You can leave a response, or trackback from your own site. Interesting to see that you solved the clues in almost the same order and had the BOING/BINGO confusion too! This was only my second complete wordy Listener, so it’s very helpful to read your comments after the fact. By the way, I think tyrant was a more neutral description of the way a leader acquired power before it became a pejorative term. Thanks for your comment, Rodney. I hope you are getting as addicted to the Listener as other visitors to Listen With Others.